Of course reading and thinking are important but, my God, food is important too. How fortunate we are to be food-consuming animals. Each meal should be a treat and one ought to bless every day which brings with it a good digestion and the precious gift of hunger. While it was hard not to drool over so many foods I'd never seen before, I could never help but wonder how the food vendors supported themselves. Selling food on the street looks like a tough job, dodging traffic all day, breathing in exhaust fumes, wiping away dust constantly. Many street vendors had their children with them or, oddly, a cat tied to a string. I don't know how much food vendors make a day, but considering that they earn about $1 a sale, I can't imagine their profit margins are wide enough that they go home to a mansion every night. Surprisingly, though, vendors were always polite and friendly when I bought from them and their presence really made for great people watching in Thailand. Bangkok is a massive city, meaning lots of people... and food. My apartment was located off Sukhumvit Road, a popular area with a decent selection of grocery stores. Unfortunately, the city is not the easiest to navigate as a pedestrian and walking to the closest store took 15-20 minutes, a lifetime for this delicate gringa in the heat. Also, I had difficulty finding good-quality fresh vegetables for sale in the food stalls and carts. 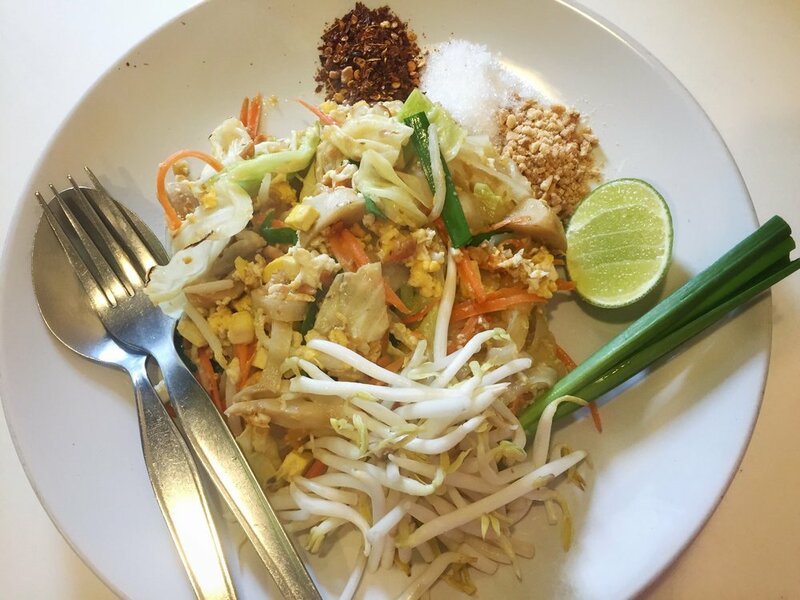 Considering those factors, I convinced myself I was in a food desert and thus began my love affair with Bangkok food delivery. Fortunately, food delivery is a serious business in Bangkok and there are many restaurants and services to choose from; I used ginja.co.th because it's the only account I could set up without local phone service, and I was never disappointed with deliveries. Delivery is cheap and fast (hello, city of motos) and among so many affordable, healthy options, I really liked Veganaire and Broccoli Revolution. So kudos to Bangkok for amazing vegan restaurants and food delivery. Being in tropical territory, it was impossible to resist fresh fruit carts and cheap beer to ward off the heat. Thailand is teeming with street cart vendors, and my favorites were the ones selling fresh fruit for less than forty cents a bag; vendors are masters at chopping up fruit in such a compact space, it's amazing. As for the beer, it's interesting to note that, per a 2015 national law, alcohol can only be sold 11:00 a.m. - 2:00 p.m. and 5:00 p.m. - midnight everyday at stores and supermarkets (and some restaurants). In my experience, though, small stores are more than happy to ignore this rule for a sale because, hey, money talks here. Every Sunday afternoon to evening, Old Phuket Town's main road is transformed into a vibrant, pedestrian-only street food market. While most of the food was not vegetarian/vegan, I did find enough things to sufficiently stuff my face with. It was fascinating to see so many new foods, and costs ranged from less than a dollar to a few dollars, making for an affordable (and delicious) tourist attraction.